It promised to be an interesting day with several football specials to Cardiff where Blackpool were playing Orient in the division 3 playoff final. 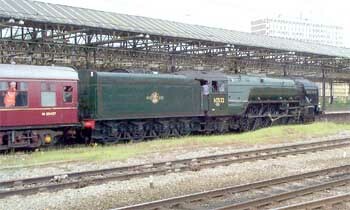 There were also the Manchester diversions and 60532 "Blue Peter" was out and about with a special to Blackpool. 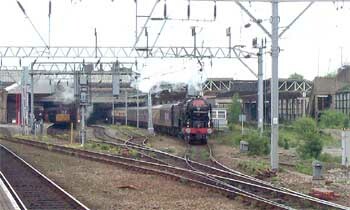 First was a centre road diversion with 47841 "Spirit of Chester" en route for Manchester. 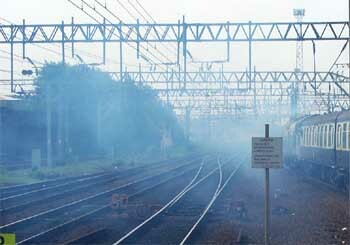 .........before powering off West for Wales and Cardiff's Millennium Stadium. 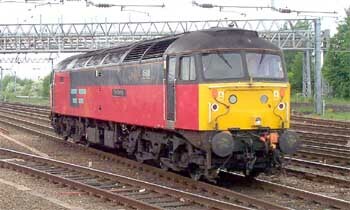 Parked in the bay was 37038 waiting to leave with 1V77, a Cardiff relief train scheduled to leave at 9.13. 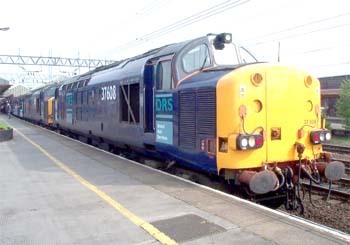 ...which followed it round the curve onto the Shrewsbury line - it smelled like a fall of soot! 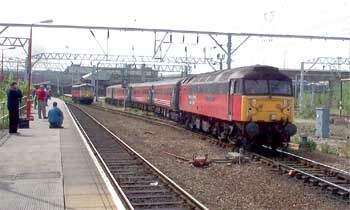 Some time later the first of the Blackpool specials arrived in platform 5 behind Fragonset Class 31 locomotives 31602 "Chimaera" and 31459 "Cerberus". 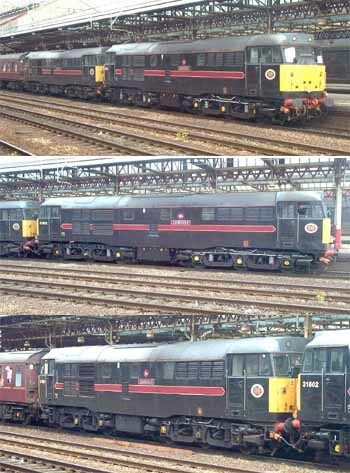 They looked quite smart in their black livery. 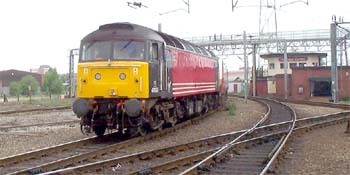 Meanwhile at the North end of the station 86425 "Saint Mungo" had arrived with a London - Holyhead train which was subsequently taken West as the 10.37 by 47725 "The Railway Mission". 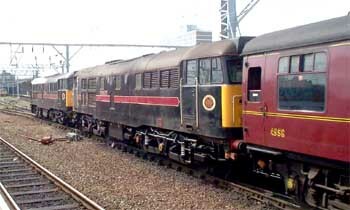 86425 is parked on the left. 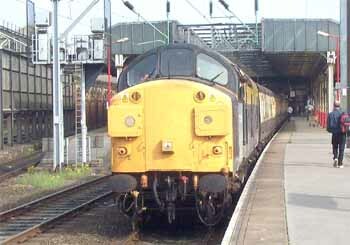 A few minutes later the second of the Blackpool trains ran through the platform 12 loop hauled by Fragonset class 31's 31190 "Gryphon" and 31601 "Bletchley Park 'Station X' ". 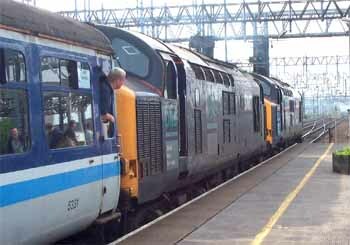 Normal services carried on through this busy period and the Class 175's are now appearing in multiple. 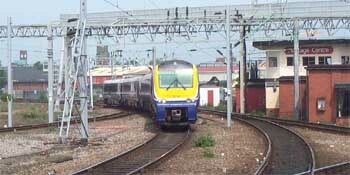 Here 175011 and 175006 are entering platform 11 with a Holyhead - Birmingham train. Back at the northern end (by this time shattered) the NER pacific left to the sound of its LNER hooter which does sound a bit weak for an engine of this size. 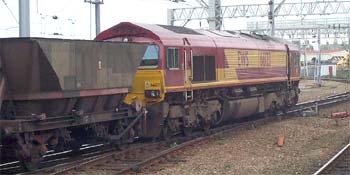 So, the locomotive is carrying two warning devices - is this unique for a main line engine? Two headboards as well - you can't be too careful these days I suppose. 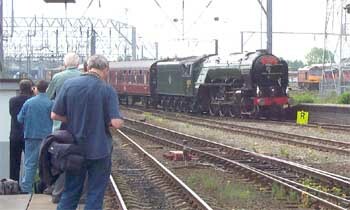 It looked terrific and you could hear the 3 cylinder beat all the way up the West Coast Main Line as it was pushed a little. I don't know if there was a potential problem with "Blue Peter" but as it left platform 12 there was a class 47 ticking over in platform 6. 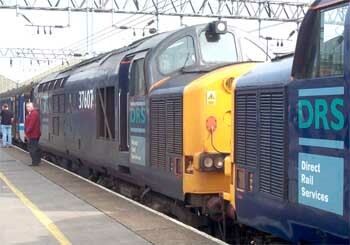 As soon as the pacific had cleared the crossover and onto the down slow, the diesel powered off up the down fast. 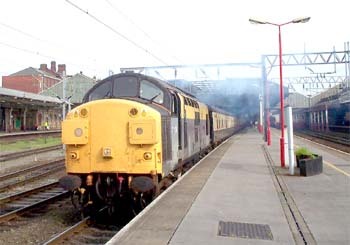 Maybe coincidence I don't know but I would have given anything to have been in the class 47 cab with a video camera if it ran alongside. 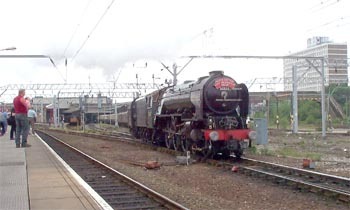 47746 "The Bobby" is seen here leaving at a pace. 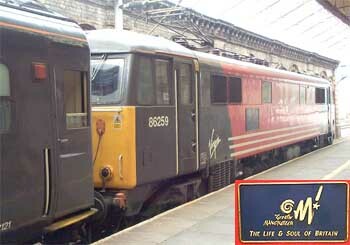 .....where it was replaced by 86259 "Greater Manchester - The Life & Soul of Britain" hmmmm!! 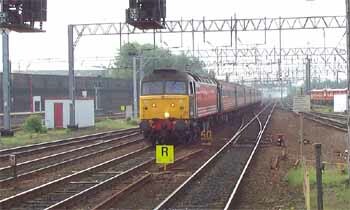 66123 then pulled through with a train of hoppers and headed North by which time I couldn't take any more excitement and left.